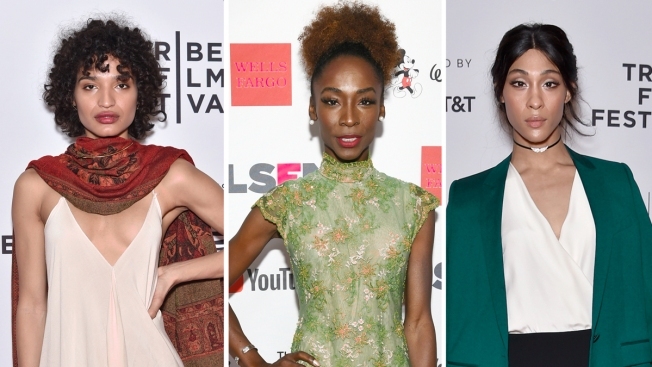 Indya Moore, Angelica Ross and MJ Rodriguez. Ryan Murphy and FX are making TV history. The network has ordered "Pose" to series. The new dance musical drama features television's largest cast of transgender actors in series regular roles and is the largest LGBTQ cast ever for a scripted series, according to FX. "Pose", which is executive produced by Murphy, Nina Jacobson, Brad Simpson and Brad Falchuk, is set in the 1980s and "looks at the juxtaposition of several segments of life and society in New York: the rise of the luxury Trump-era universe, the downtown social and literary scene and the ball culture world." The series features Evan Peters and Kate Mara as Stan and Patty, a couple from New Jersey, and James Van Der Beek plays Matt, a financial kingpin and boss to Stan. After a nationwide search, the series cast MJ Rodriguez, Dominique Jackson, Indya Moore, Hailie Sahar and Angelica Ross. Tony Award winner Billy Porter and newcomers Ryan Jamall Swain and Dyllon Burnside also star. "I am thrilled to join forces with John Landgraf and FX Networks and FXP and Dana Walden, Gary Newman and Fox 21 Television Studios to present what I think is a game changer of a show, which at its heart is an uplifting series about the universal quest for identity, family and respect," Murphy said in a statement. "Along with being a dance musical and an affirming look at American life in the 1980s, I'm so proud that 'Pose' and FX has made history right from the beginning by featuring the most trans series regular actors ever in an American television production. Additionally, the first season 'Pose' will feature 50-plus LGBTQ characters--a record in American television history. I can't wait for people to see this incredibly talented, passionate cast." The order from FX is for eight episodes. Production begins in February in New York with premiere date targeted for summer of 2018. "Pose" was written by co-creators and executive producers Murphy, Falchuk and Steven Canals. Murphy is directing the first two episodes. Alexis Martin Woodall, Sherry Marsh and Erica Kaye are also executive producers with Janet Mock and Our Lady J serving as producers. Through Murphy's Half Initiative and the Directing Mentorship Program the series will bring on emerging transgender directors for mentorship. "In the 15 years we've worked with Ryan, he has demonstrated time and again that every person's story is joyful, illuminating, and must to be told," FX's Landgraf said in a statement. "With 'Pose', Ryan, and his producing partners Nina Jacobson, Brad Simpson, Brad Falchuk and Steven Canals, introduce us to a new group of characters whose talent, life force, and self-made community is greater than the daunting obstacles created by a society that can be threatened by their native identities."